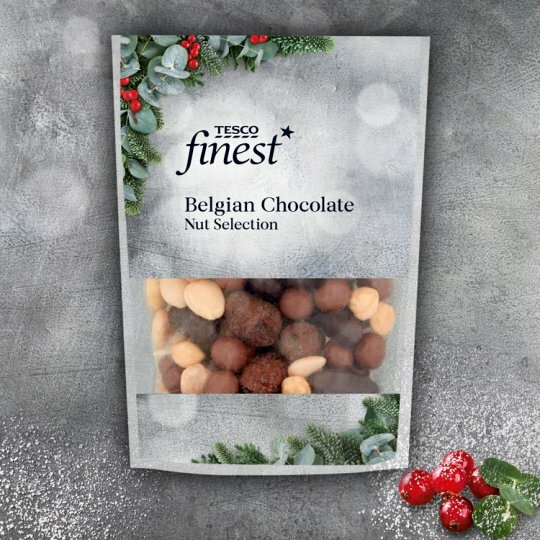 A selection of milk chocolate coated hazelnuts and almonds, dark chocolate coated Brazil nuts, roasted hazelnuts, blanched almonds and Brazil nuts. INGREDIENTS: Hazelnuts (26%), Milk Chocolate (25%) [Sugar, Dried Whole Milk, Cocoa Butter, Cocoa Mass, Vanilla Extract, Emulsifier (Sunflower Lecithins)] Brazil Nuts (20%), Blanched Almonds (15%), Dark Chocolate (9%) [Sugar, Cocoa Mass, Cocoa Butter, Vanilla Extract, Emulsifier (Sunflower Lecithins)], Almonds (1.5%), Cocoa Powder, Cocoa Butter, Tapioca Starch, Glazing Agent (Shellac). Also, may contain peanuts, other nuts, sesame seeds and soya. For allergens, see ingredients in bold.